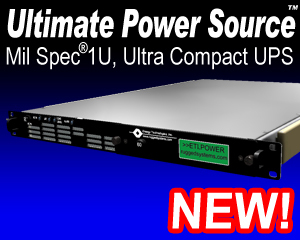 The heavy-duty chassis occupies only 3U (5.25”) of rack space while delivering up to 2000 VA of clean, uninterruptible power. The rounded metal corners and rugged handles, both front and rear, aid in safe handling. Internally, all major components are well secured and electrically insulated to prevent damage due to shock and vibration. Rear shock isolation/alignment bushings off load the slides when the unit is fully engaged. The rear panel provides locking connectors for the input and output power with various optional configurations available. The output connectors are standard NEMA 5-15R receptacles with stainless steel cable restraints. This reverse air flow version draws air through the front and exhausts out the rear vent into the rack. A removable and washable intake air filter and high capacity stainless steel ball bearing fan provide added protection in both controlled and hostile environments. The batteries are maintenance free with immobilized electrolyte and are constructed of flame retardant materials. For more information, see the Battery Technology section. A frequency selection switch is available for those sites requiring 50-hertz output instead of the standard 60-hertz. The Status connector provides an interface with optional computer software providing loss of AC and low battery status as well as remote shut down capability. The PDU Remote Control connector provides an interface to optional remote display/control panels.